So here’s a post that is long overdue, an appreciation of David Black’s The Black Hack. In short, it’s David’s Rules for running no-nonsense D&D games at conventions and short online games. You can spin campaign games with it since it still has level progression, but beware the experience rules amount to “characters gain levels when the DM says they do”. Which I like, as a middle-aged dad I’ve not got time to run the old week in week out experience point grinds of my teenage years. Its roots are firmly in the old school, with four OSR four classes, each of which gets a page listing their restrictions and special abilities in the A5 booklet. Then it expands and refines the rules base with cool bits from other modern derivatives ( such as Dungeon World’s GM doesn’t roll, 5th Edition’s Advantage roll) and bits of the author’s devising (such as usage dice for keeping track of expendable items, the initiative system where you test against Dexterity on a D20 and if you fail you go after the monsters). Monsters and spells are no-nonsense, a short paragraph with essential stats. that fit in a couple of tables over two or so pages. For example, monsters are presented as Armour, Hit Dice, and quick special abilities. And that’s the big thing about the Black Hack, it really presents the game in a very clean bare-bones fashion, with no unnecessary padding. Apart from the game’s logo which also acts as the cover image, there is no art, just a very clean and effective graphic design and typography (are you beginning to see a theme here?) At the time it had me scratching my head thinking “is this actually an RPG?”. 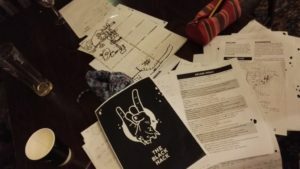 I got to test the rules out at Furnace 2016 where I had initially offered to run a 5th Edition game but had failed miserably to get my head around the three books in the time that I had pitched the game and I was due to run it. So instead of panicking, I thought “why bring three heavy thick hardcovers to the table, when I can bring one slim a5 booklet” 🙂 So I ran a playtest with my home group, who as fans of various editions of D&D had it under a stern gaze, and it passed with flying colours! Same when I ran it at the convention, with a group of players of varying experience with D&D. It just worked and delivered Maximum Gaming Fun. Which is the win with any role-playing game, and the point where the Black Hack became one of my “you’ll pry this from my cold dead fingers” games. While I may not have got my efforts out there, there is a dizzying array of free and low-cost games and supplements for the Black Hack. DriveThruRpg.com lists 386 at present. Cthulhu Hack by Paul Baldowski (Just Crunch Games). Cthulhu done lo-fat style using the Black Hack. Fully suppported with a range of adventures and supplements. Heroic Fantasy by Graham Spearing (Wordplay Games). If you want more classes, such as the Barbarian and the Bard, more monsters, races (Dwarf, Elf etc) a bit more guidance and a full adventure, this 89-page game delivers. Kaigaku by Jacob DC Ross (Thunder Egg Productions). A slimline take on Samurai Roleplaying, that has all the flavour of the 90s classics that inspired it but none of the rules bloat. Author David Black has decided to do a 2nd edition packed with more examples, art, and other cool stuff to make the game even cooler than it already is. It’s currently on Kickstarter now, and its legions of fans have pushed it over the 500% funded mark already. 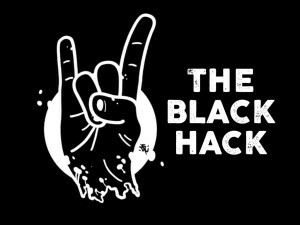 Black Hack 2nd Edition Kickstarter. This entry was posted in The Black Hack by Newt. Bookmark the permalink.